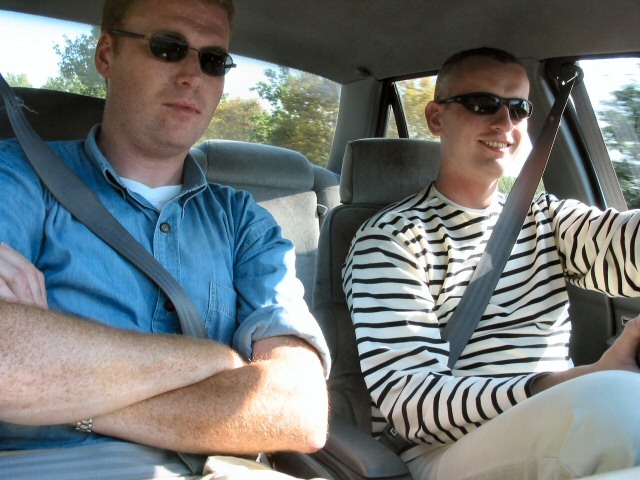 In April 2002 it happened, I suddenly realized that I needed a holiday. I have had it with work and decided to book a nice short vacation. The first thing that popped into my mind was Normandy. I started looking for people who had some houses to let on the internet, it so happened that I ended up with Topic Travel. 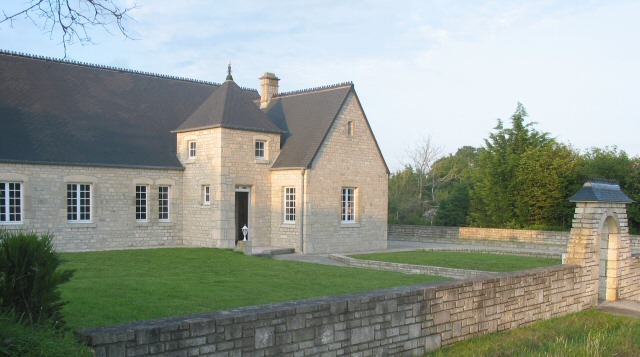 They had some nice houses to let in Normandy. After 5 minutes I had found a nice little house where I could vision myself living for a couple of days. It so happened at the time that I was chatting with Jan Chris, a friend of mine. Well as it turned out he also needed a short vacation. Within the hour the vacation was booked. We had planned to leave on the 29th of June to a small village called Colomby in the community of Valognes. Valognes is situated in the northern point of Normandy 25 km southeast of Cherbourg. Everything was arranged, we where ready for our adventure. Some more good news arrived when we heard that good friends of us, Walter and Christa, would leave for Brittany with their son Noah a week earlier. They liked the idea to come and stay with us for a week in Normandy. Everything was arranged: France……here we come. 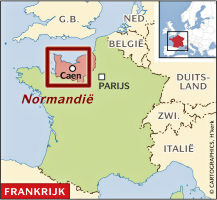 Below you can find the locator of Normandy and the well made map (thanks to Cartographics) of Normandy in France. 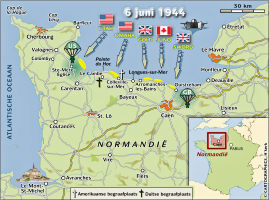 The map of Normandy can be enlarged and will be shown in a seperate window. In the map all the different sites of importance during D-day are shown. Easy when you read the report. It is the 29th of June, 6 AM, the alarmbel makes a very irritating noise. It is much too early but it is all for a good cause. The first day of our holiday started. With all my stuff packed I travelled to Schiedam to pick up Jan Chris at the starting point of our journey. At 7:30 AM we started our 750 kilometres long trip south bound. My feeling told me that Normandy was a lot closer to the Netherlands. While driving down south however it turned out to be much further. To keep the moral high the right foot had been put down a little bit more. Well ... we will see if the Gendarmerie have taken some nice photographs of use. The will probably be blurry and I am not going to pay for a blurry picture hahaha. When we finally arrived in Colomby it took us 30 minutes to find our little castle. It was situated far away from any population that the road to the house turned out to be somewhat like a puzzle. But we can’t be fooled, so after some effort we found our little castle. A nice little house with three bedrooms a nice kitchen, living room, dining room, bathroom and a big garage. 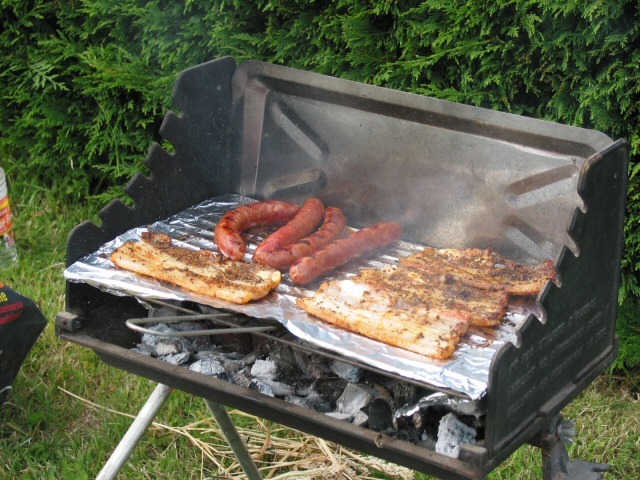 Surrounding the house was a big garden which was perfectly suited for barbeques and it also was a nice playground for little Noah. At one side of the house there was a nice gravel path, which we could use to play petangue while holding a nice glass of red wine. We almost felt like real inhabitants of France. Normandy is not only ideal to relax and enjoy the good food and wine but it is also an ideal place to enjoy the countryside. Of course when in Normandy you have to dive into the history of the 2nd World War. In this story I will not only tell you about the 2nd World War but also about other nice and interesting places we have visited. As stated earlier, Normandy was the most important place during the 2nd World War. Churchill spoke the famous word “Ok” with which on the 5th of June 1944 he started the invasion of occupied Europe by the Allied forces on the beaches of Normandy. During two days or so we visited a couple of historically important places. There are so many things and places that can be visited that you need more than one week to do so, so we had to make a selection. The different spots we visited are also shown on the map above. 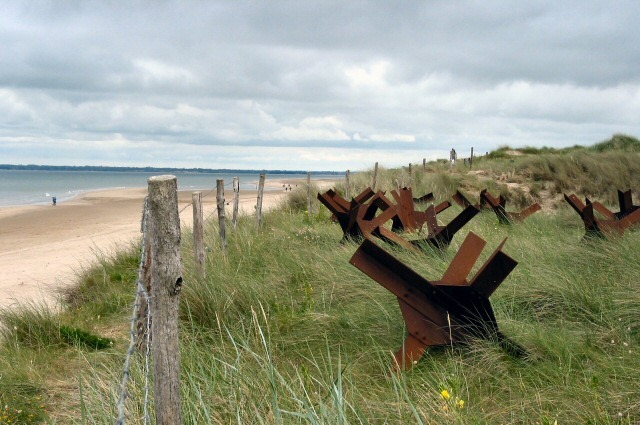 The most Western situated invasion beach was Utah beach. 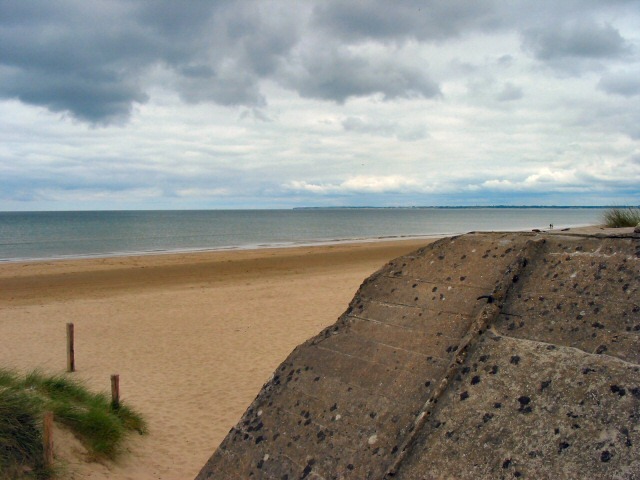 It was the only invasion beach in the La Mancha region and was used by the 4th and the 7th US Army. Together with the paratroopers they had a very important task. First of all they had to create a safety route in case of a failure of one or more invasions in one of the other sectors, second they had to breakthrough to Cherbourg. 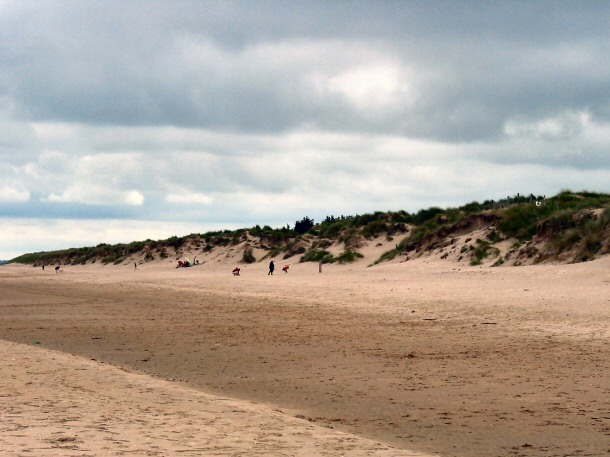 The invasion of the beach went relatively well, on this beach the number of casualties was relatively low, 200 soldiers lost their lives during this invasion. This was accomplished by bombing the German strongholds before the Allied troops invaded the beach. More inland, behind the beachhead, we found a little restaurant which also is an internet café; "Le Roosevelt". To the naked eye it seems a little insignificant building, but appearances may deceive! During our stay in the gift shop we where overheard by a Dutch guide who told us that he and his group where about to see something special, he invited us to join him. Well he didn’t have to say that twice. He took us through the kitchen of the restaurant to a sub terrain bunker complex beneath the restaurant. During WWII the Germans used this bunker as their main communications bunker in the region. After it had been taken over by the Allied forces they used it as their communications bunker. 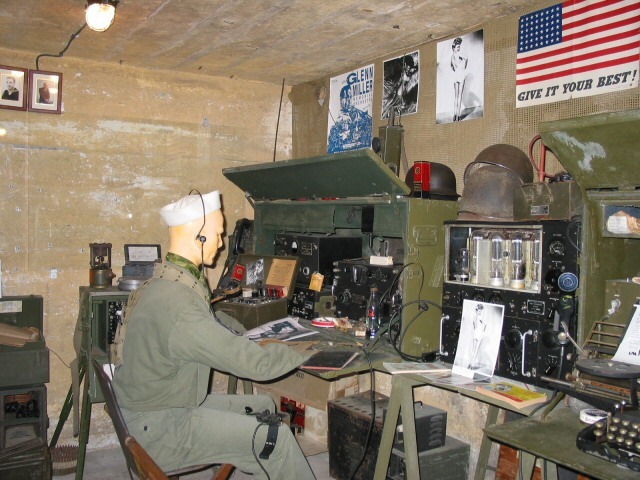 The bunker is a nice historical site, especially due to the numerous autographs and text on the walls left their by the soldiers, the entire room has been brought back to it’s old style. It is filled with communication apparatus and breathes the life of WWII. 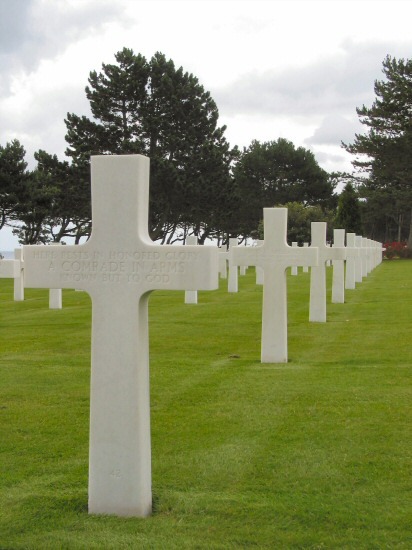 It is a very special place, which you definitely have to visit when in Normandy. 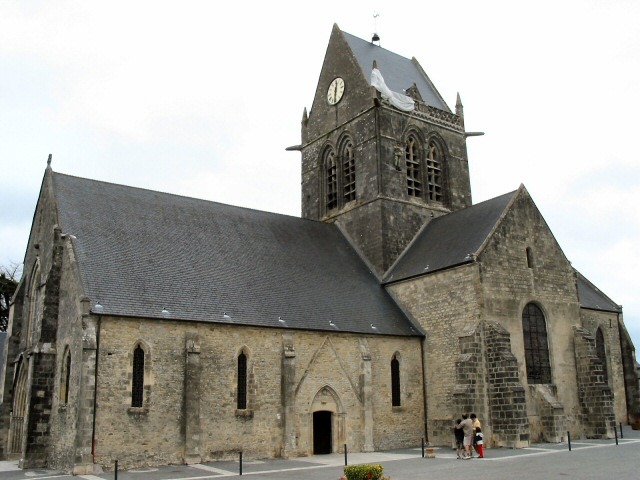 The village Ste-Mere-Eglise was the most important village during the invasion of Normandy by the American paratroopers. On the 6th of June 1944 at 1:00 AM 15.000 paratroopers of the 82nd and 101st airborne division where dropped above this village. The drop turned out to be all but a huge success. Only 6000 troopers are able to fight after the drop. The remaining troopers get lost or lose their lives in the surrounding swamps. Some of the troopers reach the ground so far away from the desired landing spot that regrouping turned out to be impossible. Some of the troopers landed approx. 30 Km away form Cherbourg near the village Barfleur, most of the time these men where on their own. The troopers had a little ticker with them that made the sound of a cricket, the idea was that they could “recognise” each other with it during the night. Unfortunately the sound of cocking a German Mauser was the same. You can imagine the impact off this “mistake”. At the end of the night the Americans succeed in liberating the village and at 4:30 AM the American flag appears above the village. With the taking of the village the American troops also secured an important route trough Normandy, “highway 13”. The victory in Ste-Mere-Eglise was off great tactical importance. A very important symbol of the operation at Ste-Mere-Eglise is John Steele. 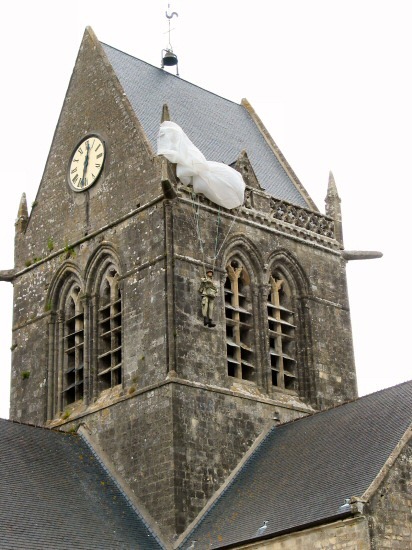 This paratrooper got stuck with his parachute on the church tower. German gunfire hit him but he managed to survive and his fellow paratroopers rescued him. A doll on the church tower reminds us of his ordeal during this frightening period. The second day we drove more to the East in the direction of Gold beach. On this beachhead, between Graye-sur-Mer and Arromanches-les-Bains, British troops of the 50thand 8th tank division landed. 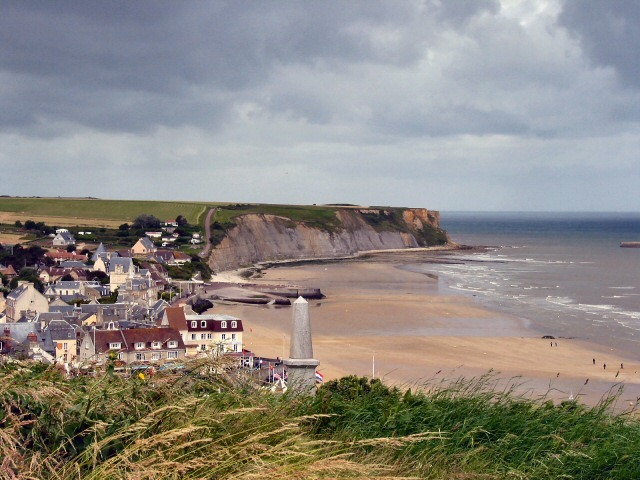 Their task was to liberate the city Bayeux and to takeover the cliffs around Arromanches. The invasion went relatively easy without any great casualties or losses of material. The region was taken over fairly quickly and the building of a great artificial harbour started. The harbour was named Mulberry B and was intended for the British troops. Another harbour was build near the village Vierville (Mulberry A) that could be used by the American troops. Unfortunately this harbour gets destroyed by a heave storm, which lasted three days. Due to this all the supplies for both armies had to go through Arromanches. 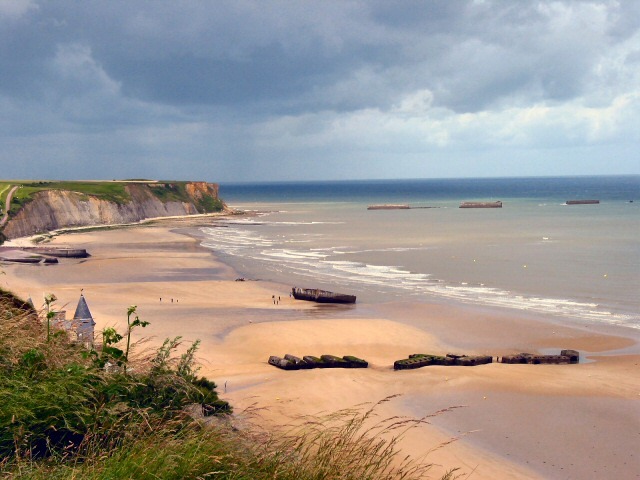 Today you can still see the remains of this artificial harbour on the beach and in the water around Arromanches. It is also possible to view an 18 minute movie, which shows the invasion and battle of Normandy. The 360 degrees movie is projected on nine screens around the visitor. It is rather nice to see, but it is an “attack” on your stomach and you tend to get seasick while viewing the movie (if you are sensitive to it), an other thing is that you can’t view everything at once so you miss most of the movie. Personally I think these images deserve a better showing than this! Here you find a good preserved part of the German Atlantic-Wall, situated near the coastline we find a big German coastal gun. This is one of twelve guns, which the Germans used to shoot at the Allied fleet. The Allied forces repeatedly bombarded these big coastal guns before the invasion started but the Germans still succeeded to put up a big fight. With help of the French resistance the Allied warships finally succeeded in destroying most of the guns. 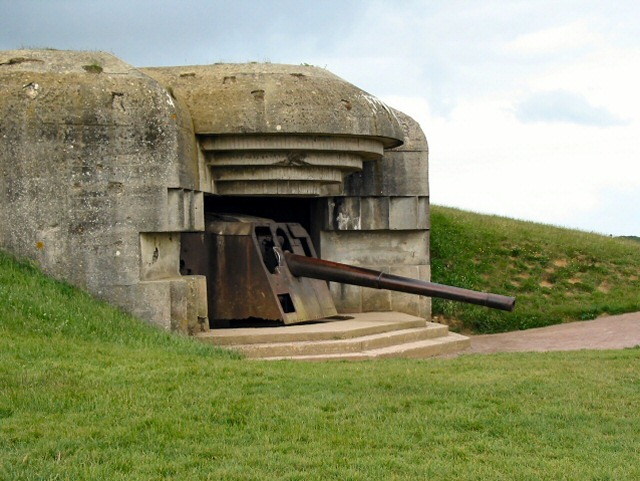 The gun complex consists out of four “casemates” each with a 150 mm canon which had a maximum operating range of 20 Km. 300 meters in front of the guns we fins a observation post which was used by the commander to give the right shooting coordinates to the gunnery crews. Form this observation post sector Gold and Omaha could be covered. 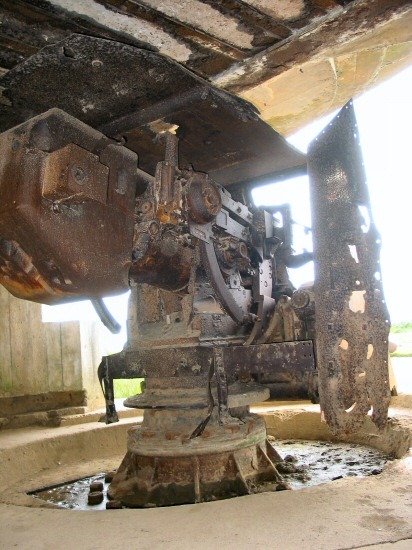 The gun site at Longues is preserved best. Therefore this is the best one to visit during you stay at Normandy. 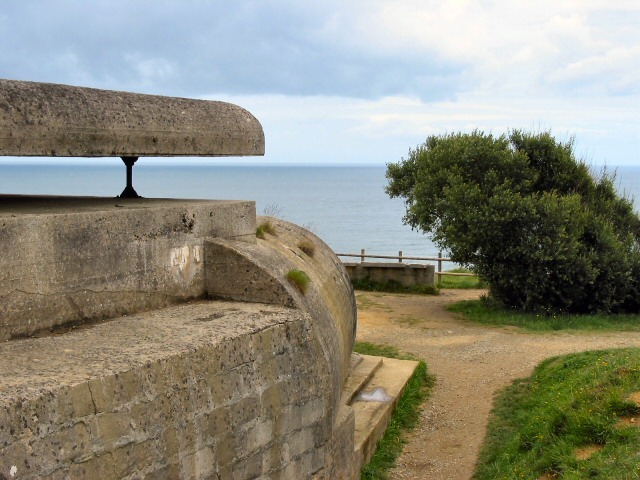 On a cliff above Omaha beach, in the village Colleville-sur-Mer, we find one of Normandy’s most impressive locations. 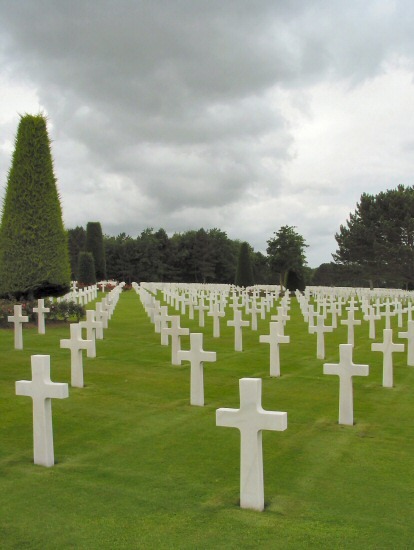 On approx 174 acres we find a huge American cemetery. Here 9387 American soldiers are buried who fought for our freedom, 307 of them where impossible to identify. The thousands white marble crosses are an impressive site on the green meadows. The whole place made an extremely great impression on us. The cemetery was given to the US by the French government; the American Battle Monuments Commission takes care of the grounds. Behind the monument we find a wall; “Mur des Disparus”. A wall with on it the names of 1557 men who where lost in action or could not be identified. 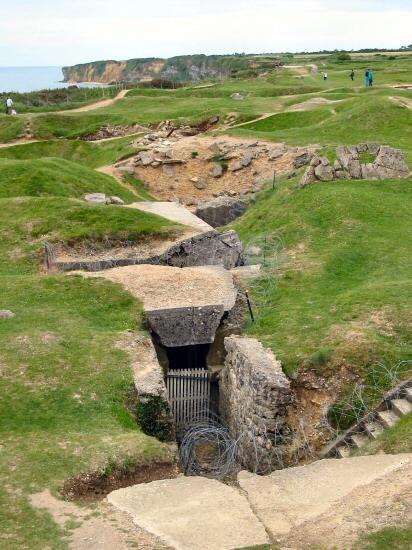 Another very interesting and famous site to visit while in Normandy is Point du Hoc. This is a 30-acre piece of land with a pointy end in the Atlantic Ocean. The Germans had fortified this point by placing six 155 mm guns. At the edge of the cliff they had build an observation post, this post was also used to give firing directions to the six guns. The 2nd American Special Forces battalion under the supervision of Colonel James Rudder had the difficult task of capturing this very important landmark. 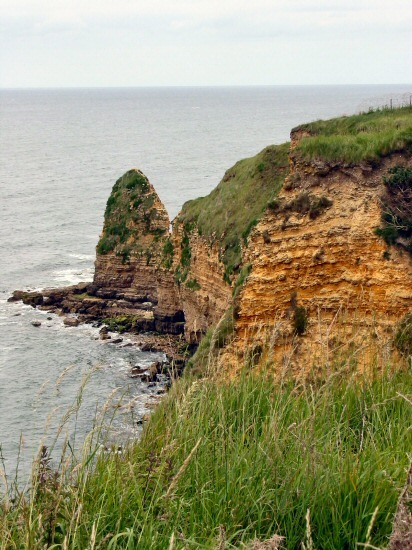 Before the taking of Pointe du Hoc both the Allied Air force and Fleet started a heavy bombardment on the site. More than 700 tons of bombs where dropped by Allied planes and 600 shells where fired from the warships just off the coast. The effect of this huge bombardment is still visible, Pointe du Hoc looks like one big moon landscape. 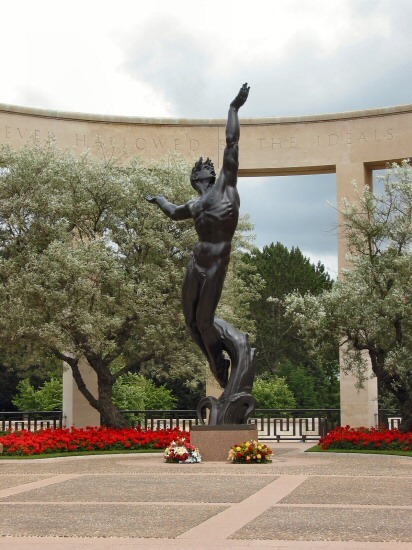 The heroic battle of the American Special Force’s lasted until the 8th of June 1944. It is only then that the American forces capture Pointe du Hoc. After this fierce battle it turned out that the Germans, because they where in the process of building the bunkers, had hidden the six guns in a field nearby. 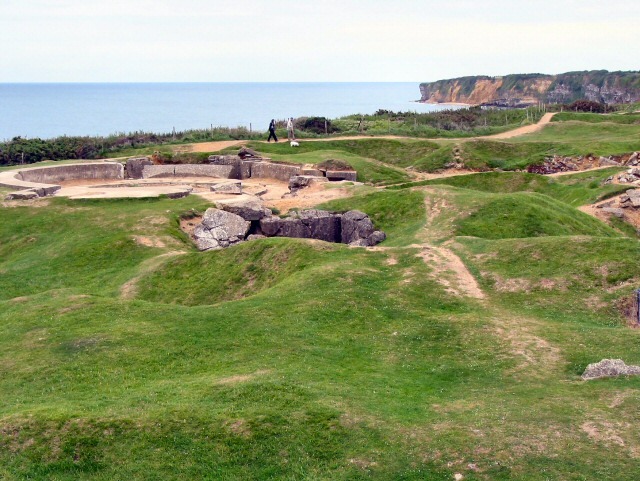 The battlefield of Pointe du Hoc has been almost untouched after the battle. It is still as it has been left after the battle on the 8th of June 1944. They only difference now is that there is a monument on the place of the former observation post to keep the memory alive of the fierce battle that had been fought there. Near La Cambe next to highway 13 we fiend a German cemetery. On approx. 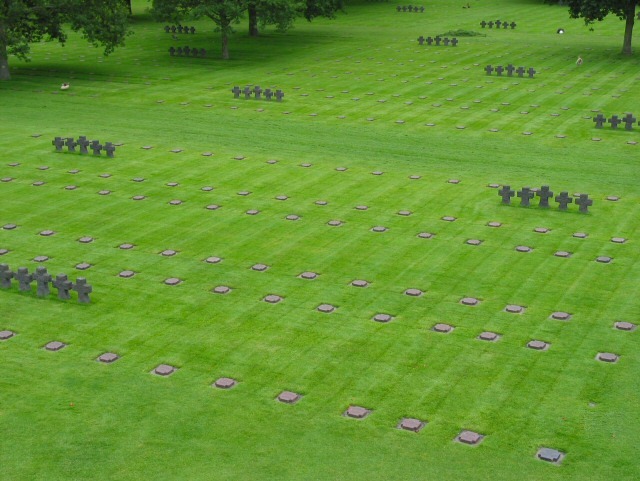 5-acres of land 21.222 German soldiers are buried, 296 of them are not identified. The first thing that attracts the eye are the 1221 identical Ahorn treas, which are planted along the 1200 meters long road, that leads to the cemetery. Until now it is still unclear to me if they have a special function. Through a portal, which also is a chapel, you can enter the cemetery. 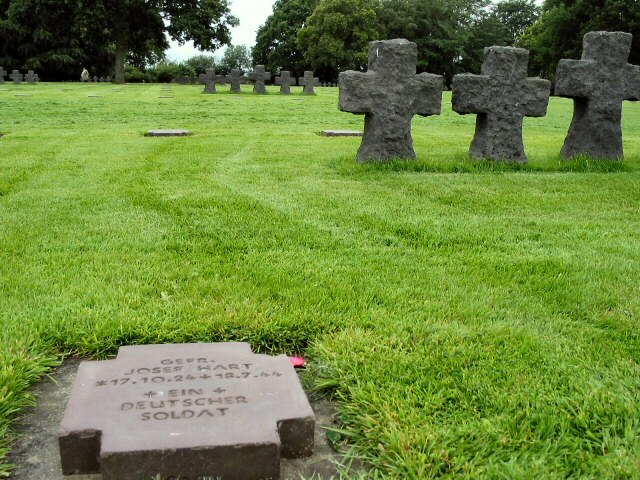 Under every headstone 2 German soldiers are buried. Across the cemetery wooden crosses have been placed in groups of 5. In the middle of the cemetery we find a memorial hill with a big granite cross and on both sides granite statues. The entire cemetery gives a very depressive impression. Especially when you have just visited the cemetery of Colleville. However, keeping the history of Normandy in the back of you head this can be understood. Well after reading all of this you might think that the only places I visited where connected to the Second World War. Well this is not the case. As an addict to the Ocean I had to visit the beautiful Normandy coast. Clear Ocean ... sand beaches ... cliffs ... chalk cliffs. An infinite diversity, so I had a lot of other places to go to. We decided on driving along the coast for a day, Walter, Christa and Noah joined us. Actually we also did this because Walter told me that he is a member of the Delft Lighthouse Association. So he wanted to visit as much lighthouses as possible for the guys at home, he said (Yeah….. right!). Anyway, Walter is a respectable guy so how could I refuse!? We went out to look for beautiful places. And we found them! 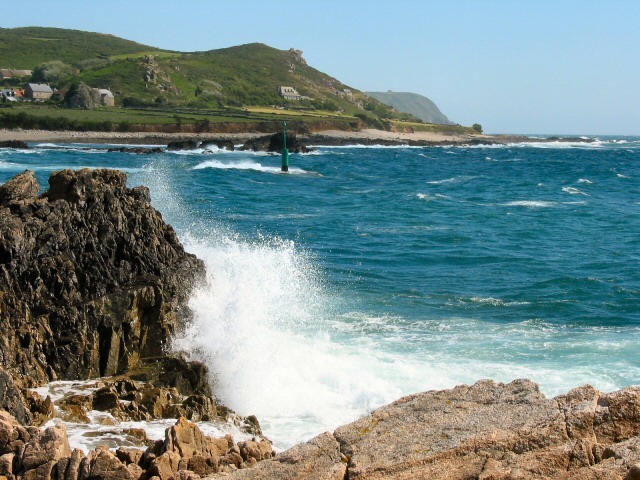 A very beautiful spot at the coast is Cap Lévy. It lays approx. 15 km to the east of Cherbourg. First follow road D116 and then leave this road and enter the lovely village of Fermanville. After driving through this village you will end up at Cap Lévy. There are hardly any tourists and you can enjoy the sound of the Ocean and the blowing of the wind. 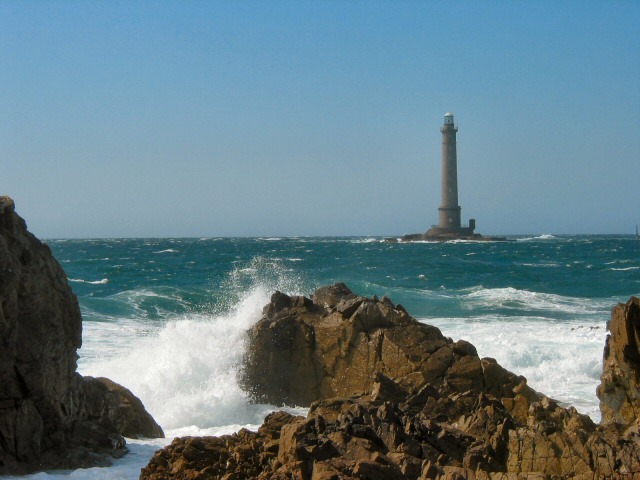 If you like the Ocean and a beautiful view you have to visit Cap Lévy. Another nice spot is the far western point of Normandy. Approx. 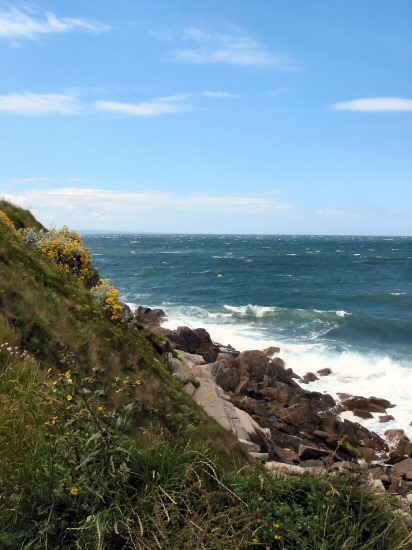 30 km west of Cherbourg and near the nucleairplant of Cogema you find Cap de la Hague. A nice site with big rocks who try to withstand the power of the Ocean. And….lucky us, they had a lighthouse there! Walter your buddies can be proud of you! Near the border of Bretagne we find another very interesting site. On a rock we find Le Mont-Saint-Michel. A small world wonder, which attracts many, many tourists. So Jan Chris and I were certainly not the only visitors! Busses loaded with people come to this place to look at its beauty. 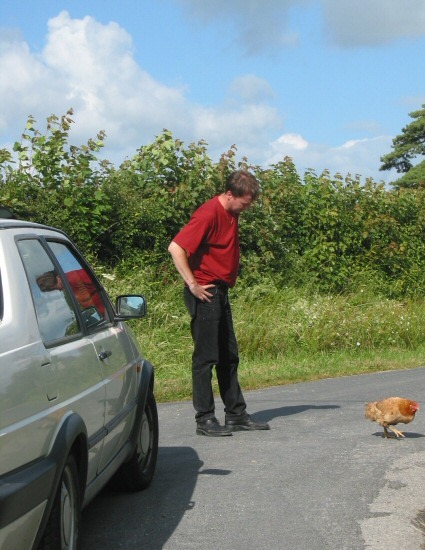 So in this case we could not ignore our fellow tourists! 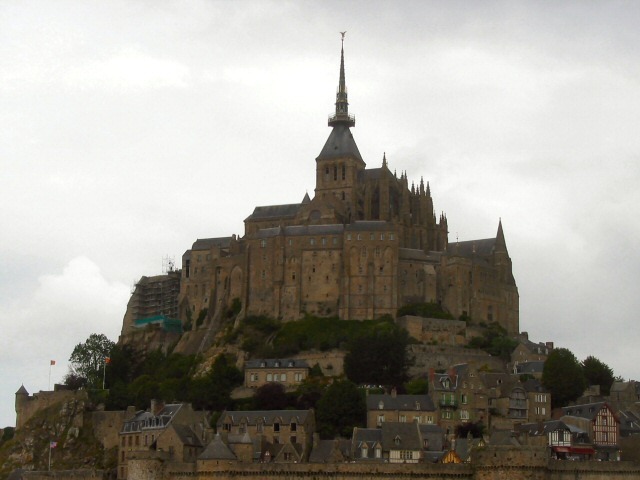 The history of Mont-Saint-Michel goes back to 708 AD. In that year Aubert, the bishop of Avranches, gave order to build a sanctuary in honour of the angel Michael. Soon after this place would become very important pilgrimage. From the tenth century the Benedictines situated themselves in the abbey and around the cloister a village arose. Mont-Saint-Michel also became a military fortress, which turned out to be impregnable to the English forces during the 100-year war. It becomes a National unification symbol for the French.During the French revolution until 1863, the abbey becomes a prison. In 1874 Le Mont-Saint-Michel becomes a national monument and since 1979 is listed on the world inheritance list of the UNESCO. 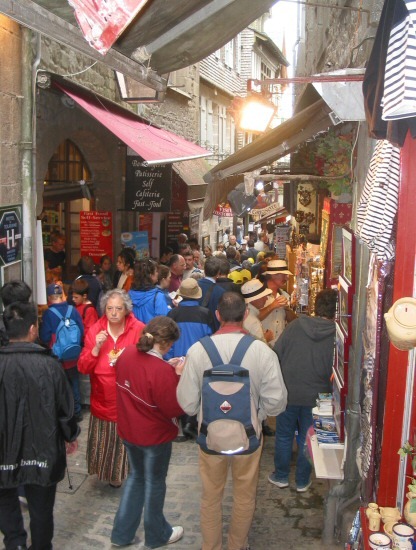 Nowadays Le Mont-Saint-Michel is frequently visited by large masses of tourists. You have to make yourself a path to the top of the mountain in order to reach the abbey. The big climb is not very good for your legs and knee’s but the view is worth it. During the way up you will pass a huge amount of souvenirs shops, restaurants and museum’s. 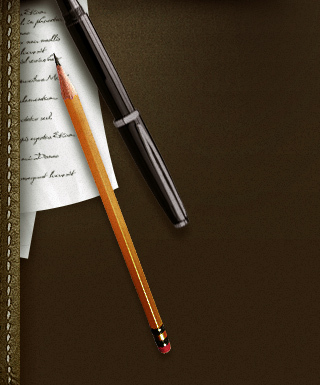 The impression arises that the only thing that they are interested in is getting money out of you pocket. The prises are sky-high, so it would be wise to bring you own food and drinks! Unless off course, you just won the lottery! 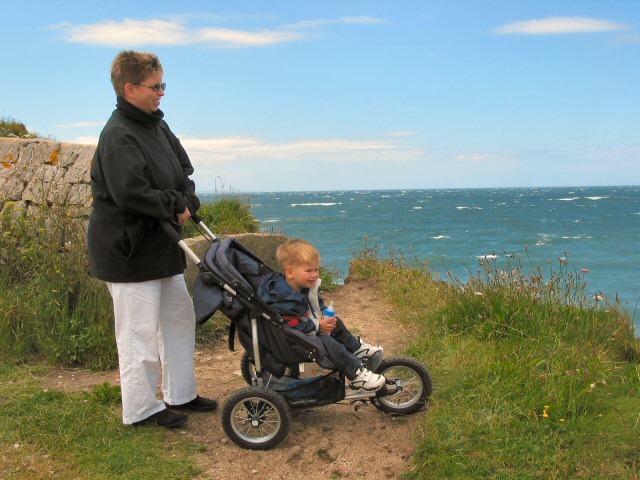 And people, leave the buggy for the kids at home, as we saw it turned out to be an impregnable fortress for buggies to! But after all, the atmosphere was relaxing and very cosy. 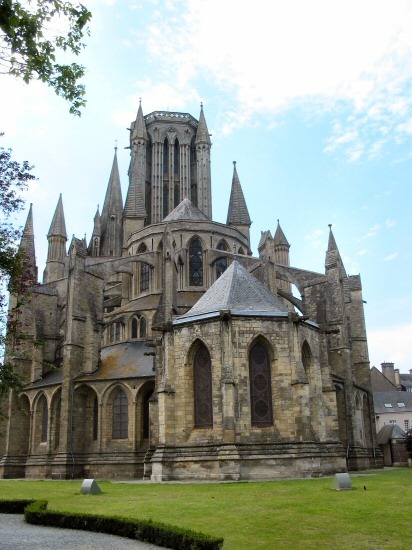 On the way back from Le Mont-Saint-Michel, we passed Coutances. The city is situated on a hill and the skyline is magnificent. We could clearly see a very beautiful cathedral, and because we had some time left before we had to be home for Walter’s famous pancakes, we decided to visit the cathedral. It turned out to be from the 13th century, the Gothic period. Very beautiful to look at, both from the inside as from the outside! But the weather was so beautiful that we decided to go about and have a drink on a nice terrace. As it turned out in France they also had trouble converting from the Franc to the Euro. We where rather surprised by the bill at the end. But anyway that couldn’t spoil our good mood. 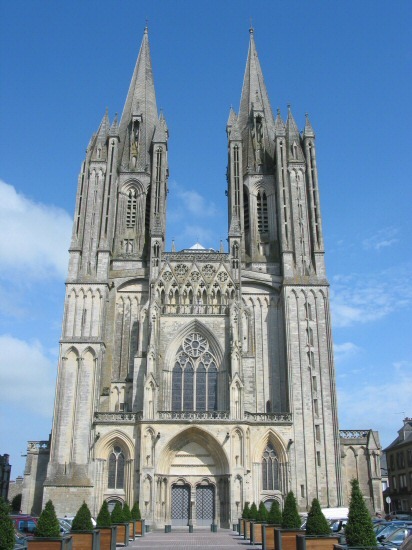 Soon after we drove back to Colomby, so we didn’t see too much of Coutances. 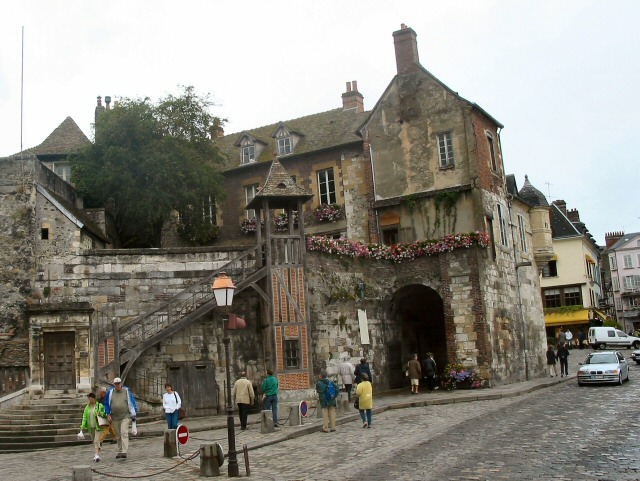 The last thing that I would like to tell you about is the beautiful village of Honfleur. This ancient village is situated at the estuary of the river Seine across Le Havre. An ICQ friend of mine, Sophie from Paris, told me that it was worth the effort to go and visit Honfleur. As it turned out she was right, and Jan Chris and I where glad that we followed here advise. The weather was bad, but the village was very cosy. It seems to exist out of restaurants and art galleries. The village is the ideal place for all kinds of artists; it looks like one big museum! The buildings and houses are very beautiful and the streets are narrow and old, the atmosphere is so nice! 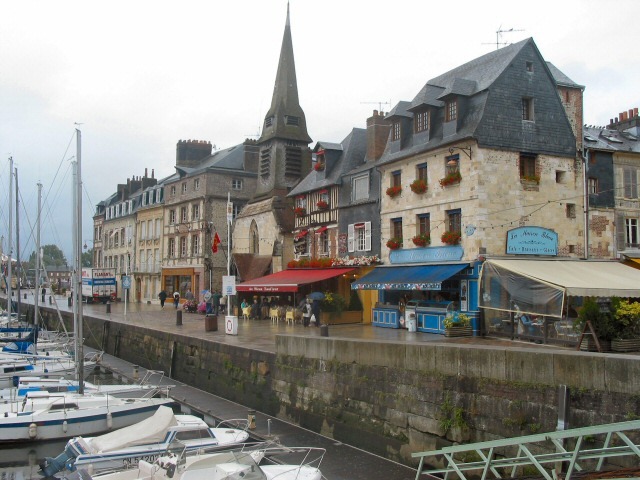 If you are in the neighbourhood you must pay a visit to Honfleur! Honfleur was our last stay over in Normandy. It was time for us to return to The Netherlands again. 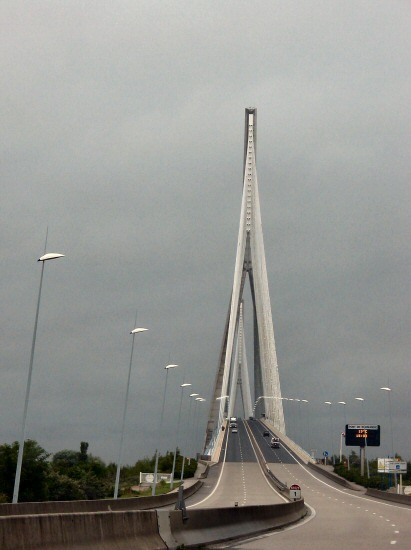 On our way home we past a the nice bridge to Le Havre. An impressive bridge that I wanted to show you at the end of this report. I already booked my next vacation to Barcelona in Spain. Hope you will join me again on this trip.